The world of Internet-based streaming audio services is vast compared to traditional terrestrial (AM and FM) radio solutions. If you’ve got an old alarm clock or portable boombox, it likely is limited to terrestrial options and perhaps some physical media. Grace Digital Audio is aiming to modernize these devices with their Allegro portable Wi-Fi Internet radio, the smaller sibling of Grace Digital’s Micro Hi-Fi system we recently reviewed. The Allegro advertises access to thousands of Internet radio streams, podcasts, popular services such as Pandora, SiriusXM, MP3Tunes, NPR, BBC, etc., audio stored on a PC or MAC, an alarm clock and “unparalleled audio quality for a portable radio” via Wi-Fi without the use of a computer. If that were not enough, Grace Digital Audio also includes an infrared (IR) remote control and offers free Android and iOS remote control apps. The Allegro’s long list of features is likely to suit many so let’s see if it deserves a spot in your home or office. Weight (Radio and Batteries): 2 lbs. 8 oz. Examining the Grace Digital Allegro GDI-IRD4000, the exterior body is primarily constructed of medium density fiberboard (MDF) covered in a black vinyl material commonly found on speakers. A metal grille protects the speaker with the LCD and rest of the front protected by plastic. The controls on top are plastic chrome-colored buttons save for the large metal knob used for navigation. The chrome buttons did have some slight surface scratches, but these are quickly forgotten when not closely scrutinizing them. Moving to the rear, the battery compartment and ported back are constructed of a solid gauge of black plastic. Finally, the bottom has four anti-skid feet. Overall, the Allegro is an attractive product that will likely be suitable for many places in the home such as the bedside, desk or bookshelf. The remote control is constructed primarily of black plastic with silicone buttons commonly found on many similar units. Upon opening the battery compartment in the rear, the pressure used to open the battery compartment caused a crack to run vertically a few inches in length-a sure sign that the gauge of plastic used for the remote is too thin. Even with the batteries in the remote, it has a fairly light and cheap feel to it that doesn’t quite complement the Allegro itself. That said, the remote is perfectly functional and laid out sensibly. The first thing to do upon powering up the Allegro is dive into the settings and configure the clock and Wi-Fi. Before continuing, we should note that the LCD can be difficult to view in direct bright light due to the reflective nature of the plastic exterior covering or viewing at an extreme off-axis position which is typical in most LCDs. Once this is taken into consideration it generally isn’t an issue. It’s a simple affair to set the clock; however, it can only be done manually or at least we couldn’t figure out how the auto-synch feature that is advertised is supposed to work. Since the Allegro will be connected to the Internet in most cases, the capability of retrieving and syncing time via Network Time Protocol (NTP) servers would be a great feature to have. After entering the password for the WPA2-AES-protected Wi-Fi network, the Allegro connected to the network quickly. It also exhibited outstanding wireless performance and never experienced a hiccup even when the signal was passing through multiple walls and approximately fifty feet. While the radio could be configured and used mostly through the LCD menu, it is far easier (and required for some services such as Pandora) to personalize the experience by linking the radio with a code produced by the radio to Grace’s configuration web site. Once the radio is linked, services such as Pandora, MP3Tunes, etc. can be linked to the account along with internet radio stations, streams and podcasts. Most of the items are populated within the “My Stuff” menu, however some items like Pandora are not which is found under “Personal Radio,” which seems a bit disjointed, but is quickly learned from usage of the radio. When using Pandora, the Grace Digital Allegro GDI-IRD4000 presents all of our Pandora stations as expected and also allows for adding new stations via the LCD interface which is a handy, but tedious, method. The IR remote also has the special “thumbs-up,” “thumbs-down” and “skip” Pandora buttons, but these buttons are not found on the Allegro itself. Configured Internet radio stations under “My Stuff,” work as expected. In other words, the experience is very much the same as if the station was listened to via a web browser. There is even a section of stations titled “My Local” where all the local radio stations are pre-populated which is quite convenient. Podcast playback under “My Stuff” was identical to the Internet radio experience; however, even though podcasts are not live like Internet radio, content cannot be fast-forwarded or paused. The Grace Digital Allegro is also not able to resume podcasts if they are stopped. Having grown accustomed to using a full featured media player makes listening to podcasts on the Allegro a bit disappointing due to the limited functionality. In addition, considering the popularity of managing podcast RSS feeds in Google Reader, it would be useful if the Allegro were able to import feeds directly from a Google Reader account instead of requiring them to be entered one-by-one using the web configuration interface. All of our podcasts played back except for one. We’re not sure why the podcast would not work other than a continual “Retrying” message when attempting to play it back. Allegro’s “Media Player” section allows the radio to connect to UPnP (Universal Plug N Play) servers or Windows network shares. After selecting a UPnP server (Windows 7 PC with music library shared by WMP) on the network, connection was immediate. Music can be selected by artist, genre, album, playlist, folder, etc. and added to the playback queue. Full transport controls (play, pause, skip forward/backward) are available. The Allegro can work with a variety of music types, however, even though Windows Media Audio (WMA) is specified, it was not able to play WMA lossless files successfully. On the whole, the “Media Player” is just what we would expect save for the inability to playback WMA lossless files. Moving on to the “Alarm Clock” functionality, the Allegro provides the ability for up to five separate alarms to be configured with the flexibility to configure each to occur once, daily, weekly, weekdays or weekends. The alarm can be set to use a buzzer or Internet radio station or podcast. Additionally, there is a configurable sleep timer that can be set anywhere from thirty seconds to twenty-four hours. The alarm functionality was more than expected, but since this is an Internet-connected device, integration with a service such as Google Calendar with the ability to import reminders would be spectacular. We disassembled the unit and found that a single 3” diameter cone speaker is used for sound reproduction. We found the sound of the Allegro perfect for casual listening. At times, the bass can distort if driven too hard, details tend to get lost and the sound is obviously mono. Expectations must be tempered since this is a portable unit that can operate on batteries and compromises must be made. The Grace Digital Allegro also offers an analog output. When listening through headphones, the sound was excellent and there was no discernable difference between the Allegro and a media player utilizing identical material. We would be remiss if we didn’t mention that Grace Digital also provides a free remote control application for iOS and Android users. We evaluated the Allegro with the Android version (for iOS information, check out our review of the GDI-IRMS300). The Android app provides almost complete control of the Allegro and is organized reasonably well. We did experience some bouts of unresponsiveness on occasion, but the experience via the Android application was superior in many respects when compared to using just the LCD and IR Remote. Setting alarms, configuring playlists, entering new stations, etc were all things that the Android application excelled at. Power usage of the system was measured at the wall using a P3 International P4460 Kill A Watt power meter. Unfortunately, there is a tiny power draw even with the unit switched off. When in sleep mode or playing audio, the Allegro uses relatively little power and shows the efficiency of its Class D amplifier which is critical when functioning off the NiMH AA cells. The Allegro does give an option to disable Wi-Fi when in sleep mode for power savings, but then this negates some of the advantages of sleep mode (quick power on to listening) vs. off mode (forty seconds before fully booted). A discharge test using six 2600 mAh cells with the Allegro playing audio through its speaker resulted in a running time of five hours and thirty-three minutes before the batteries required a recharge. From the discharged state, the Allegro charged the batteries fully in approximately two hours and twenty minutes. We appreciated the battery gauge presented on the LCD but wish that it would also show the charge state when the unit is charging as well. The only indication of the batteries being fully charged is to look at the Power Status LED located on the rear. Note: The discharge test was done after a few charge-discharge cycles on the batteries to give them a chance to reach their full capacity. The Grace Allegro GDI-IRD4000 is quite a convenient and feature-packed product. We find it attractive and competent despite its shortcomings. The biggest improvements that we think Grace Digital could make would be in the podcast management and playback experience. Fortunately, the Allegro’s firmware can be upgraded so we look forward to seeing improvements to the current user experience and hopefully support in the future for any new services that may emerge in Internet-delivered audio. While the sound quality just may be “unparalleled” for a portable radio, one must not expect miracles from a 3” diameter mono speaker. We have enjoyed our time with the Allegro and found its portability and small form factor coupled with the vast array of Internet audio content had us listening in new and unexpected ways. 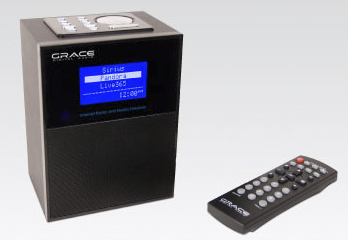 Thanks to Grace Digital Audio for providing the Allegro portable Wi-Fi Internet radio review sample which can be purchased from Amazon or Newegg.